Between 4th and 7th July Sandra from the Bread Houses Network participated in the seminar “Experiencing a fairer and more caring society” organized by All Together in Dignity – Fourth World – an international non-governmental organization and a movement of solidarity among and in collaboration with the most excluded families around the world . The event brought together more than 30 people from Romania, Macedonia, Hungary, Bulgaria, Poland, France and United Kingdom. All participants are working in organizations or participate in informal initiatives aiming at supporting, including and working in cooperation with people living in extreme poverty. During the three days of presentations, discussions and workshops the participants were aiming at finding out how a fairer and more caring society can be built, based on the thinking and experience of people from the most vulnerable groups. 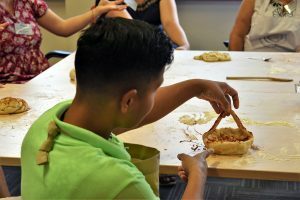 During the event took place two bread makings based on the “Theatre of Crumbs” method developed by the Bread Houses network. The participants presented that part of their work and those initiatives that in their opinion contribute the most to building a fairer society. They also shared the challenges they meet in their day-to-day social work as well as what helps them overcome them and what motivates them to continue despite all difficulties. 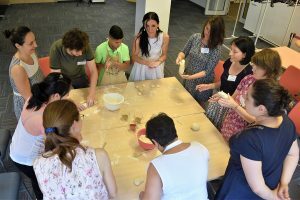 Once again the bread making proved to be a great tool for fostering discussion and for including even the shyest participants in the exchange of points of views and personal experiences.